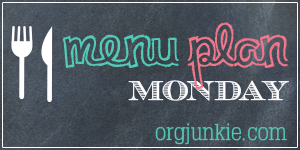 This week’s menu is built around food from my freezer clean out and a few favorite snacks I haven’t had in awhile. Putting things in the freezer doesn’t make them last forever. Although, according to foodsafety.gov foods constantly stored at zero degrees fahrenheit or below can be kept indefinitely. I’m not sure how much I trust my freezer so I go with a basic rule of keeping leftovers in the freezer for about 3 months. For that reason it’s a good idea to do a freezer clean out every 3 months. Foodsafety.gov lists recommended freezer storage times for food quality. Since I’m taking a short break from being strict about the 80 Day Obsession Meal Plan , I’m putting some of my favorite snacks on the menu that are healthy but don’t fit the plan. I love guacamole with chips. But a blue & yellow (avocado & baked chips) don’t ever intersect on my plan. Same thing with yogurt & granola (red & yellow).